I looked everywhere for an itsy bitsy spider, but to no avail. Oh so cool! What a catch! Wow! That is amazing! I would think the news media weather station would want this one! Was you waiting for this or just so happened...? +1. Cool indeed! I'd much rather see one of those than the other kind we can have here in the midwest. May I ask what this was shot with, and were you ashore, or on a boat at the time?? My son had called me during his drive home through town and said, 'There's tornadoes on the water, grab your camera and get to the beach!' So, I did exactly that...grabbed my camera, jacked my wife's scooter, and buzzed to the beach down the road (2 min ride). Sat there for a moment, and boom...waterspouts were popping out! Mahalo! 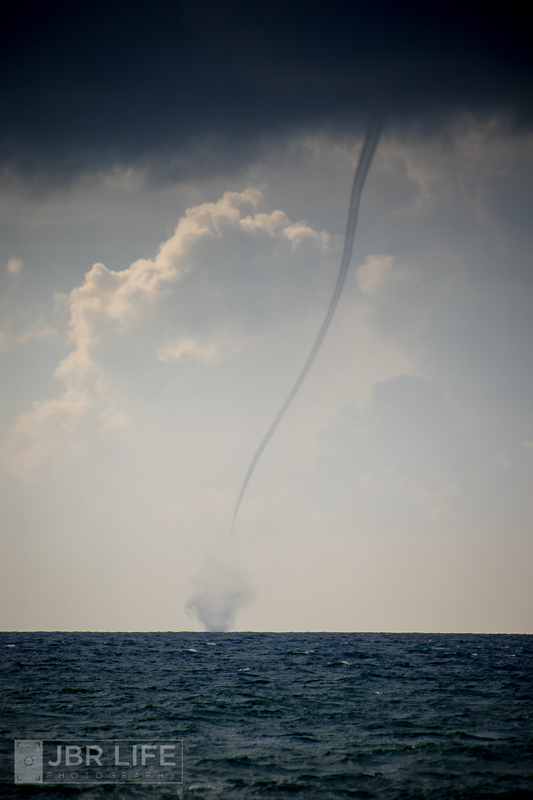 I was ashore, and this spout was about 3 to 4miles out. I used a Canon 7D mk II + EF 75-300. The hardest part was hand-holding that rig steady enough in the wind to get the shot. Because there was a light drizzle, I kept the hood on the lens, but it definitely caught a LOT of wind.